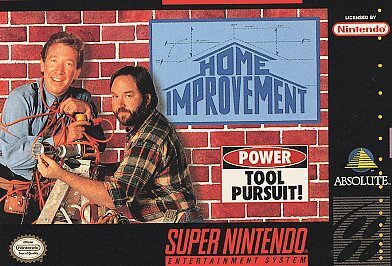 Hey, remember that episode of Home Improvement where Tim Allen goes around jumping over gaps and ledges while shooting dinos with a nail gun? Neither do I! Now the story of the game is someone stole the tools for the gang’s new super tool and Tim goes to rescue them. . Also I mean are these the only tools left on the face of the earth? Why can’t he just get a new set of tools! There was a note saying they were in the stone age and somehow Tim Allen though that they would just be another studio. If they were in another studio why is he having to jump around some huge world and have stuff trying to kill him. I mean even small spiders try to kill you. Also no one else goes to help Tim, just Tim goes while the others stay behind. It is funny though when Tim dies and his kids just shake a towel over him like that will help him from dying. Seems reasonable but then again you are playing Home Improvement the game. Now control wise this is near unplayable. You have a small amount of weapons but good luck trying to figure out how to use them. Also when your character decides to start running just admit that you will die since he doesn’t even stop when you try to make him. Also don’t try aiming with the nail gun because you can’t. Just hope you randomly hit him. Now I’d like to say that he finds his tool and everyone lives happily ever after but the game has no continues. Maybe the makers are trying to give up a hint to stop playing. Take the hint and stop playing. Never even try it.